I once wrote a tutorial on this handsewn French style headband with bead on the front; Originally I wasn't doing it with any public blog in mind, only my own, but I think it might be helpful and interesting to many, even with its little shortcomings. This is my first post in the team blog, so greetings from Finland! 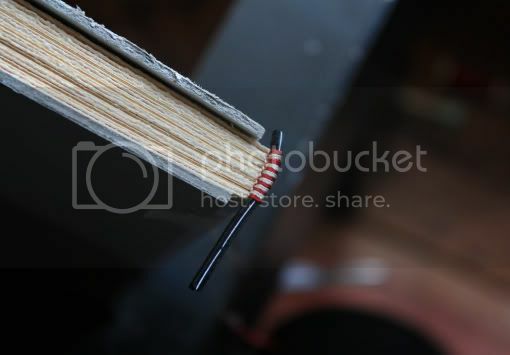 A sturdy headband is beneficial for the structure of the whole book, so I'd like to encourage everyone dealing with a bit more expensive bindings to learn some basic styles. 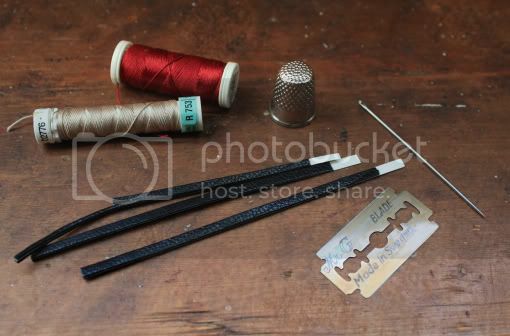 As it's somewhat time-consuming and not always easy to produce a good result I don't recommend sewing headbands just for the sake of "sewn headbands", if you know what I mean. But you are always free to experiment, and if you develop a passion for it (like I have done) you'll probably start sewing more and more each day... Because my tutorial concentrates on making a well-made and traditional looking headband yet with relative ease, I have sewn it only around one core. Traditional French headbands were often sewn around a double core - which has basically the same idea, only with more twisting. You can read the full tutorial on my blog V for Books here! If you're interested in what kind of work I do, see also my Etsy shop and Facebook page.